Last year, the iconic video game character Lara Croft returned to the big screen with the Tomb Raider reboot, starring Alicia Vikander as this new iteration. Although that film didn’t exactly usher in the long hoped-for, perpetually delayed golden age of video game movies, it looks like this new Lara Croft will get another opportunity to make that happen. That’s because Tomb Raider 2 just took a major step forward by hiring a writer. 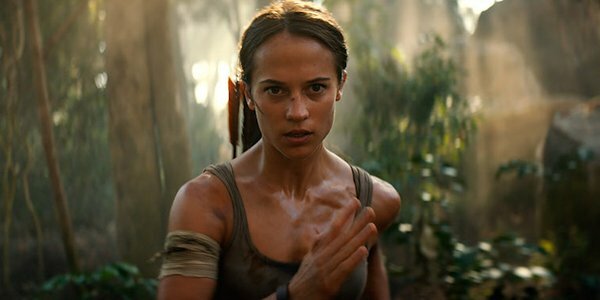 Writers Geneva Robertson-Dworet and Alastair Siddons handled the script duties for Tomb Raider, but MGM and Warner Bros. have brought in some new talent, hiring Amy Jump to pen the sequel, according to Deadline. Most of Amy Jump’s big screen work has come in collaboration with director and her partner, Ben Wheatley. Together they co-wrote 2016’s Free Fire and the upcoming Freak Shift. Amy Jump also wrote the screenplays for Wheatley’s High-Rise and A Field in England. Amy Jump has experience writing action in Free Fire and apparently Tomb Raider star and Oscar-winner Alicia Vikander liked what the writer brought to the table for Tomb Raider 2. We don’t yet know what the story will be for Tomb Raider 2, but the first film ended on something of a cliffhanger, so I would expect Lara Croft to go on another globe-trotting, tomb-raiding adventure where she continues to fight the shadowy Trinity organization that has infiltrated Croft Holdings. It is still early, and in addition to the story, we don’t know who the cast will consist of beyond Alicia Vikander or who will direct the sequel, be it Tomb Raider director Roar Uthaug or someone new. Nevertheless, this is a major step and indicates that Tomb Raider 2 is moving towards becoming a reality, and that Vikander’s Lara Croft will get at least two films just like her predecessor Angelina Jolie, who first brought the heroine to life on the big screen. This news may come as a bit of a surprise to some considering that Tomb Raider didn’t exactly blow the doors off the box office. Domestically, the film never hit number 1 and ended its run with less than $60 million. Lara Croft had much better luck finding treasure overseas though and Tomb Raider finished with a worldwide total of $274.6 million. That’s nearly triple its $94 million production budget. With this news, it is clear that MGM and WB see value in keeping this rebooted Tomb Raider going with the hopes that it develops into a successful franchise, and it has the potential to do just that. The first film seemed to have a lot going for it going in, but ultimately didn’t click together for a lot of people and critics. Tomb Raider has a 52% Rotten Tomatoes score, and yet, given the competition, some would still argue that it was the best video game movie to date. Hopefully the sequel can capitalize on the elements that worked in the first movie while shoring up those that didn’t. Alicia Vikander is incredibly talented and her lead performance was one of the highlights of the movie, so a sequel with her in it immediately has serious potential. That it seems that she approved of Amy Jump writing the sequel is also encouraging. Maybe we can even get an Angelina Jolie cameo this time around. Tomb Raider 2 does not yet have a release date, but we will keep you updated as this sequel moves forward. In the meantime check out our 2019 Release Schedule to see all the movies headed your way this year.